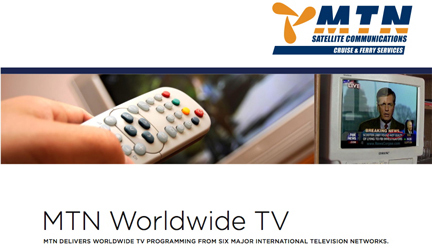 MTN Satellite Communications (MTN) has informed SatNews that the Company's new MTN Worldwide TV service is receiving a positive reception in the international cruise industry, with seven cruise lines already signed up for the at-sea telecasts. The initial customer list for MTN Worldwide TV includes Fred.Olsen Cruise Lines, Silversea Cruises, Norwegian Cruise Lines, Crystal Cruises, Celebrity Cruises, Princess Cruises, and Azamara Cruises. MTN Worldwide TV uses three overlapping satellite beams to deliver programming content from major television network providers to ships at sea. With six network providers – BBC World News, CNBC, MSNBC, Fox News, Sky News, and Sky Sports News – MTN Worldwide TV delivers premium programming in multiple content packages for North American and international cruises anywhere in the world. “We have a total of 40 ships with over 35,000 passenger cabins under contract,” said Brent Horwitz, senior vice president, MTN cruise and ferry business unit. “Installations and commissioning are proceeding at a rapid pace to meet the surge in demand.” In addition to the network TV programming, MTN will also deliver special broadcasts, such as major international sporting events to subscribers. The company has been selected by IMG to broadcast special sporting events to the maritime market in June.